Project navigation onto the windshield of your car. Head-up Display allows you to keep your eyes on the road and your hands on the wheel. Originally intended for air force pilots and later made available to luxury car owners, head up displays are now beginning to reach the masses and are on the way to becoming a household name. Why using Head-up display is great? Head up Display, or shortly HUD, is a transparent display that shows data in a person’s line of sight. The projected display makes it possible to see the information you need while navigating directly in your line of sight, which is a safer option as opposed to looking away from the road ahead. Glancing down or to the side to see the navigation can be potentially dangerous, even though it takes up only a minimal amount of time – depending on your current speed, looking away even for half a second makes you drive “blindly” for 7 to 18 meters (up to 700 inches). Quite scary when you think of it. The less you look away from the road, the better chances of avoiding accidents. Sygic came up with a solution that eliminates the need for a separate head-up device by implementing a Head-up Display into its navigation apps. 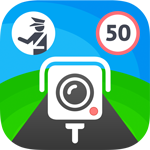 The feature is directly a part of the application so that the standard interface of the app can be switched to a design that can be projected and seen on the windshield. Thanks to its high-contrast interface, Sygic’s HUD works when it’s dark outside, without any additional accessories or devices. Simply place the phone or tablet with the activated HUD onto your vehicle’s dashboard, and the interface will be reflected onto the windshield. You can rotate the screen if you want to position the phone facing you, e.g. for easy charging. Sygic’s Head-up Display works in conjunction with the voice navigation, so in addition to visual navigation, you’ll be guided by voice as well. The quick answer is: Yes. Every driver with a smartphone or a tablet that’s compatible with the application can download it and use the function. Tip: You may like to apply a transparent reflective film onto your windshield if you see that your car’s windshield tends to blur the projected image (although not everyone will experience this issue, better try it out first). These films can be bought for less than $10. Are Head-up displays in cars safe? The question that is frequently asked is “Is Head-up Display safe?”. Or we see comments such as “It covers the windshield, it’s not safe!” or “That looks distracting”. You see directions in your line of sight, so you don’t have to look down or to the side which leads you to momentarily look away from the road ahead. It shows only the necessary information, so you don’t get distracted. It “covers” only a small portion of the windshield (the size of a phone) and it is transparent, so the road and potential hazards are still visible. It’s easy on the eyes – no gleaming bright light at night so eyes don’t need to refocus on the road. Head-up display was initially invented for aircraft pilots in order to display targets and trajectory as they were flying at night. Today, the term is mostly used in the automotive industry, where it describes a projection that is showing driving instructions on a windshield of a car. The origin of the name stems from a pilot being able to view information with the head positioned "up" and looking forward, instead of angled down looking at lower instruments. HMD stands for Head-mounted Display and is loosely related to the Head-up Display. While HUD displays information onto the windshield of the car/plane/etc., HMD displays info onto a headgear, mostly used in aircraft or motorcycle helmets. While HUD remains static, HMD moves with the movement of the head. Head up display devices come in various shapes and sizes, with prices ranging from around $50 to $500 per gadget. Manufacturers offer either standalone devices that are fixed onto the dashboard or various add-ons for mobile phones. Head-up displays also take a form of a software feature, e.g. as can be found in Sygic’s navigation software. These are the economical choice when compared to their hardware counterparts and often incorporate a wider set of functionality. 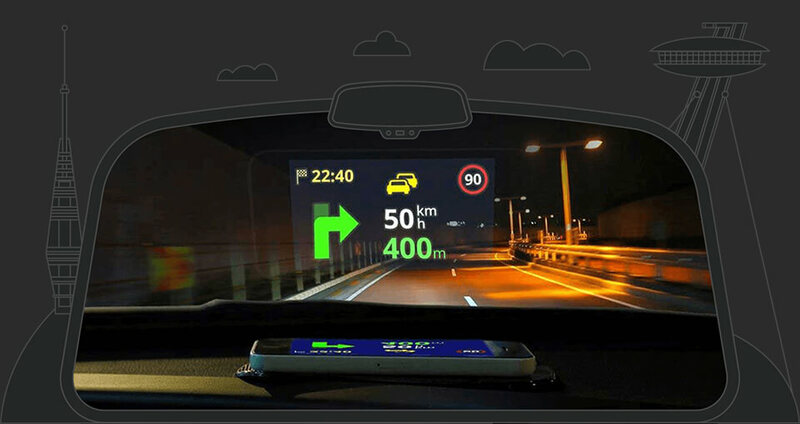 Head-up Display is an Add-on feature, you can check out our latest offer here.